Is your application running on Azure Cloud Services (web and worker roles)? As of today, Application Insights will send you an email if those roles experience common issues that might affect your application like startup failures, crashes, hangs or frequent recycles. We’ll also include diagnostic information like stack traces and error messages so you can diagnose the problem without having to log in to your server. Want some more? 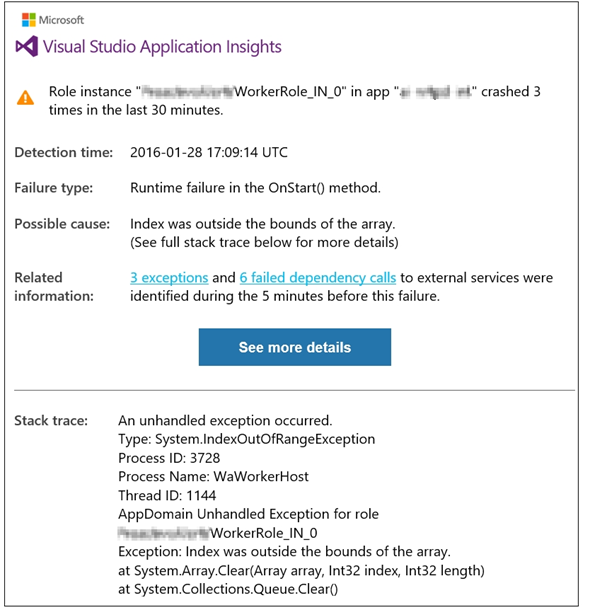 Add Application Insights SDK, to your service and we’ll let you know how your application was affected by the issue, linking to all exceptions, failed HTTP requests and failed dependency calls captured at the time. This will help you better understand the severity and impact on your users, in addition to giving you even more material to help diagnose the cause. This feature adds to the integration between Azure Diagnostics and Application Insights, which we announced in November. When you go to Application Insights in the Azure portal, you can see the timeline of the performance of your app plotted alongside platform issues such as role failures or performance degradation. We’re extending that feature by adding proactive notifications sent to you by email. This allows you to find out about issues without having to continually watch the portal. You’ll get these notifications automatically when you set up an Azure Cloud Service and configure it to send its diagnostics data to Application Insights. Nothing else is required.